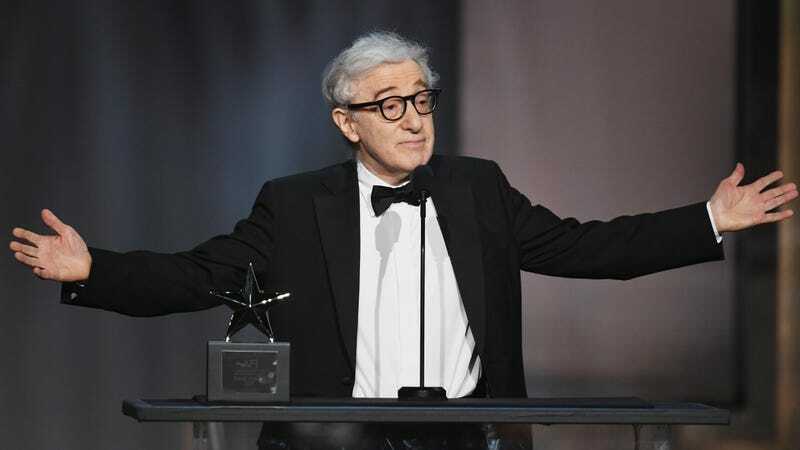 Today in, “I don’t think that means what you think it means,” Woody Allen says in a new interview that he should be “the poster boy for the #MeToo Movement”—which he kind of already is, as an example of a powerful man whose career has continued unabated despite allegations of sexual abuse. Allen doesn’t mean it like that, though. He means as a good guy. The Wrap has a transcription of the interview, with Argentinian news show Periodismo Para Todos, the kind of thing that in the pre-internet era would have been limited in its exposure to the few dumbstruck Argentinians who saw it live. But it’s 2018, which means Allen’s ability to ignore the gigantic elephant in the room with his face on it knows no borders. In the interview, Allen says, “I’m a big advocate of the #MeToo movement,” which, thanks, we guess? He adds that he should be the face of this particular movement because, in his 50 years in show business, he’s never been accused of “any kind of impropriety at all” by the actresses he’s worked with. “I’ve always had a wonderful record with them,” he says. And there’s some truth to that: Although that tide has turned in recent months, he’s certainly enjoyed the protection of many of the actresses who have worked with him, notably Diane Keaton and Kate Winslet, over the years. Allen finds it horribly unfair that this one allegation—which wasn’t even on a movie set!—gets him branded as a predator, telling Periodismo Para Todos, “what bothers me is that I get linked in with” the Harvey Weinsteins of the world. “People who have been accused by 20 women, 50 women, 100 women of abuse and abuse and abuse—and I, who was only accused by one woman in a child custody case which was looked at and proven to be untrue, I get lumped in with these people,” he says.